President Barack Obama revealed on Sunday that the U.S. launched air strikes against Islamic State militants, also known as ISIS, to help Kurdistan forces retake control of parts of the Mosul Dam in Iraq, in order to protect civilians and American personnel. "These military operations will be limited in their scope and duration as necessary to support the Iraqi forces in their efforts to retake and establish control of this critical infrastructure site, as part of their ongoing campaign against the terrorist group the Islamic State of Iraq and the Levant (ISIL)," Obama said in his letter to House of Representatives Speaker John Boehner. "The failure of the Mosul Dam could threaten the lives of large numbers of civilians, endanger U.S. personnel and facilities, including the U.S. Embassy in Baghdad, and prevent the Iraqi government from providing critical services to the Iraqi populace. Pursuant to this authorization, on the evening of August 15, 2014, U.S. military forces commenced targeted airstrike operations in Iraq." The Associates Press reported earlier on Sunday that parts of Iraq's largest dam had been retaken from Islamic State militants, who had captured it earlier this month. U.S. armed forces conducted 14 airstrikes on Sunday, damaging or destroying dozens of armed vehicles and armored personal carriers. A further nine airstrikes near the dam were carried out on Saturday. 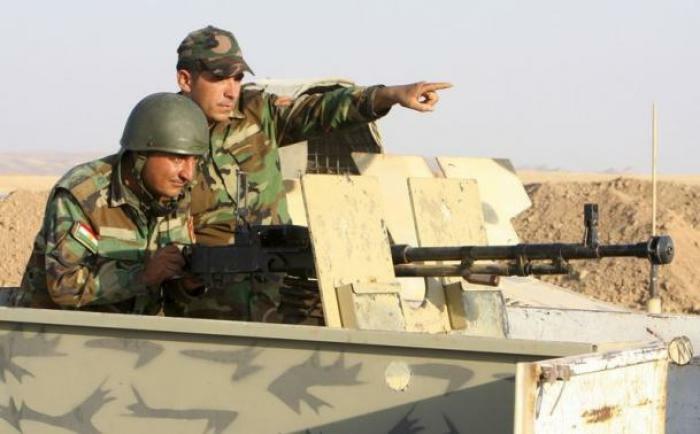 Kurdistan and the Iraqi government at large have been fighting back against ISIS, which has captured significant territory in Iraq and Syria. The terror group has been accused by the U.N. of driving out close to 1.2 million people from their homes, including thousands of Christians, and committing savage crimes such as beheading children and wide-spread rapes. The U.S. first carried out military strikes against ISIS on Aug. 8, helping tens of thousands of religious minorities escape the extremists, and helping Kurdistan forces fight off an advance on their regional capital of Irbil. ISIS and Kurds have been battling over Mosul Dam in recent weeks, as the reservoir supplies water and electricity to a large part of Iraq. In his statement on Sunday, Obama explained that he directed the airstrikes "in the national security and foreign policy interests of the United States" and said that they are "pursuant to my constitutional authority to conduct U.S. foreign relations and as Commander in Chief and Chief Executive. He added that the military actions are being undertaken in coordination with the Iraqi government. Late last week, Obama said that the U.S. would continue helping the Iraqi government in its war against the Islamic State, but clarified that he will not be sending group troops into the region. Obama said that the U.S. government will be "working with our international partners to provide humanitarian assistance to those who are suffering in northern Iraq wherever we have capabilities," but announced that that will happen "without committing combat troops on the ground." "We obviously feel a great urge to provide some humanitarian relief to the situation and I've been very encouraged by the interest of our international partners in helping on these kinds of efforts as well. We will continue air strikes to protect our people and facilities in Iraq," the president continued. "We have increased the delivery of military assistance to Iraqi and Kurdish forces fighting ISIL on the front lines." In a separate statement on Sunday, National Security Council Spokesperson Caitlin Hayden affirmed that the military mission in Iraq is consistent with Obama's directive to protect U.S. personnel and facilities in Iraq, highlighting the importance of the Mosul Dam. Hayden also noted that the operations will be "limited in their nature, duration, and scope and are being undertaken in coordination with and at the request of the Government of Iraq." The NSC spokesperson concluded that the Obama administration "will continue to consult with the Congress on the way forward in Iraq and our efforts against ISIL, and we will continue to provide appropriate reports to the Congress consistent with the War Powers Resolution."